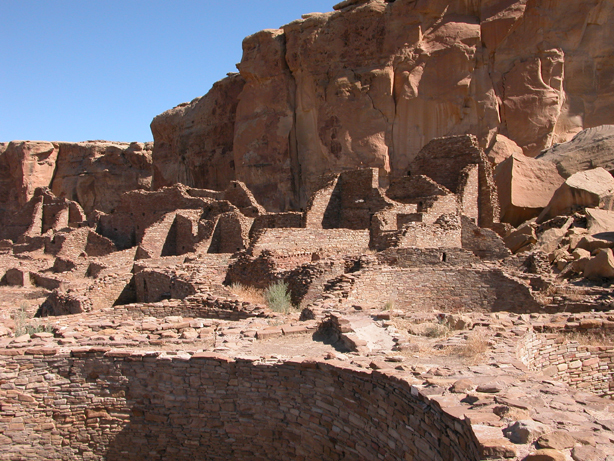 Around 1100 A.D. ancestral Pueblo peoples embarked upon a massive project in the Animas River valley. 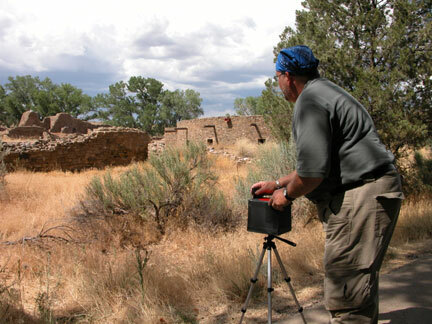 Mistaken for the ancient ruins of the Aztecs, early Spanish explorers in Northern New Mexico thought the vestiges of this community were the work of the Aztecs, whose ruins they had seen in the far south in old Mexico. 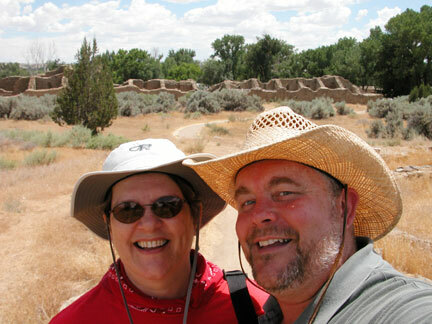 Now a National Park, the Aztec Ruins are one of the sites Lynda and I visited in the summer of 2005 in our exploration of Chaco culture. We spent the mid-afternoon taking the pinholes. 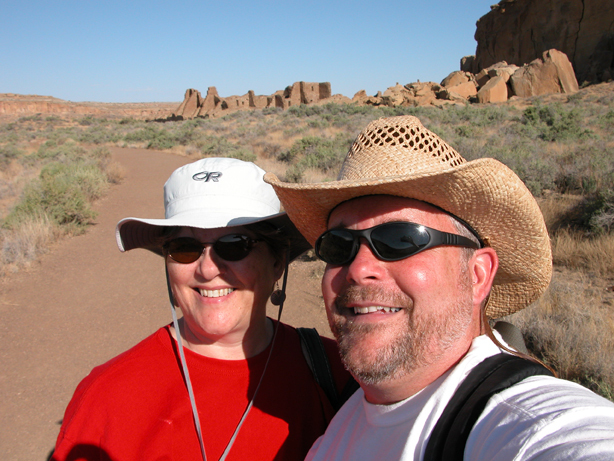 The summer of 2005 was the Southwest’s hottest in decades, Lynda and I are working in over 100º heat. We set up on a bench in the shade, where we would coat and dry the individual exposed and processed sheets. Because of the heat, there were very few people where ever we went. These ruins are close to a major highway at the edge of a small town (we had dinner in the town of Aztec and went to the stock car races later in the evening). The day before we had spent the day at Chaco Canyon (20 miles of dirt road off a major highway), where I had originally planned to shoot my pinhole work, but it was too hot. At the Aztec Ruins, the sky was filled with the huge billows of clouds that would always work up every afternoon (these would send us home early from the races as a tremendous storm worked its way way over the track in a downpour). This is a digital capture of the scene I was shooting with the pinhole camera on the last page. In the middle is the large, restored kiva that the Aztec Ruins are famous for. The images seemed to capture the enigmatic character of the site. 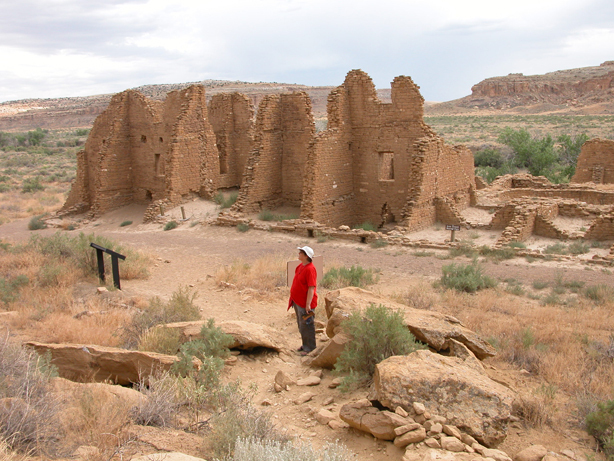 Unable to resolve the mysteries of why these types of communities were built so expertly and quickly (within decades) and abandoned almost simultaneously through out the southwest in the 11th century of our era, our imagination and science seeks relentlessly to unwrap the secrets. 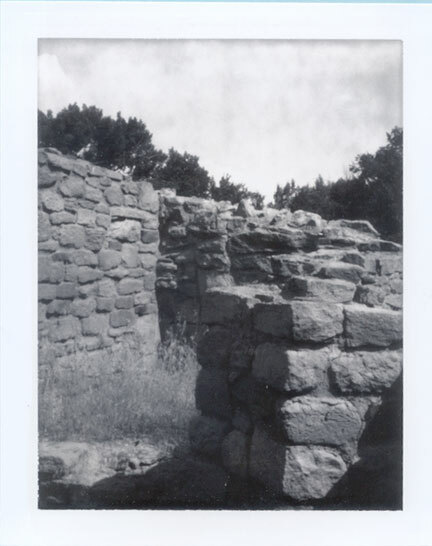 Because of the bright sun, the shadows were deep, and the Polaroid type 52 film couldn’t record both the shadow detail and the brilliant white clouds and deep blue sky. 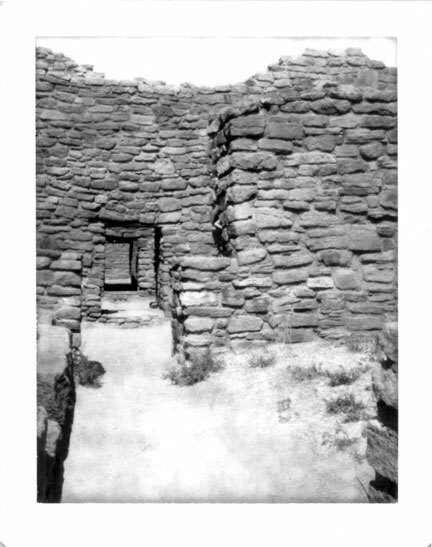 This is a view into and beyond one of the great kivas at the site. The camera is sitting on the stones at the rim of the circle, right on the edge. In the lower part of the image are some timbers that approximate the cross-stacked technique the builders used to support the roof. In the background are the cotton-woods and other trees that grow all through this river bank area. The exposures were very short, some fraction of a second. I would cover the aperture with my hand, draw the little gate, and swiftly move my hand away and back. I had many failures because of the contrast range. The best images seem to capture the way the ruins give silent testimony to a past beyond our ability to reach clearly. 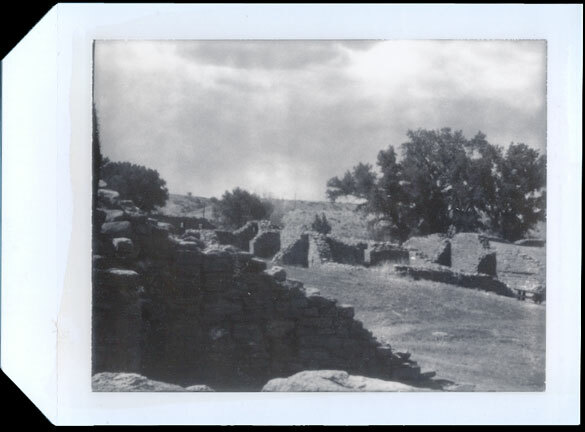 The images I like the most might suggest the first pictures Aztec’s early archeologist Earl Halstead Morris could have taken. The pinhole image seems to be an artifact, a vintage thing, even when new. I tried to hand-hold the camera for some of the pictures. This image, blurred and indistinct, with that ghostly flare, might be a fitting close and reminder of all that we don’t know. They were a people bound to nature, the seasons and the landscape, the animals and elemental forces, in intimate ways we can only dream of. Recent research seems to be uncovering suggestions of a much less peaceful and harmonious culture in their remains. 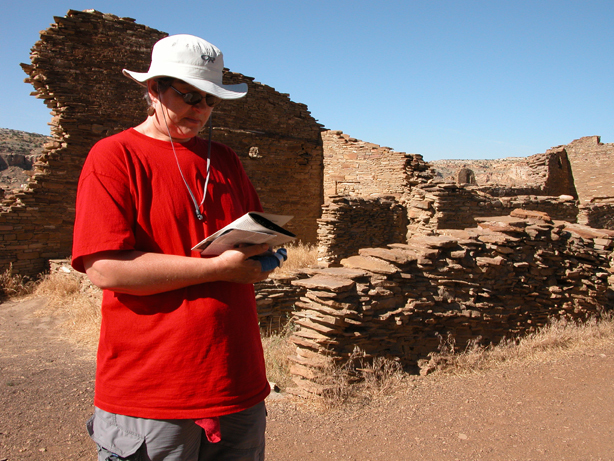 That summer Lynda and I spent some time at Chaco Canyon exploring the extensive ruins there. 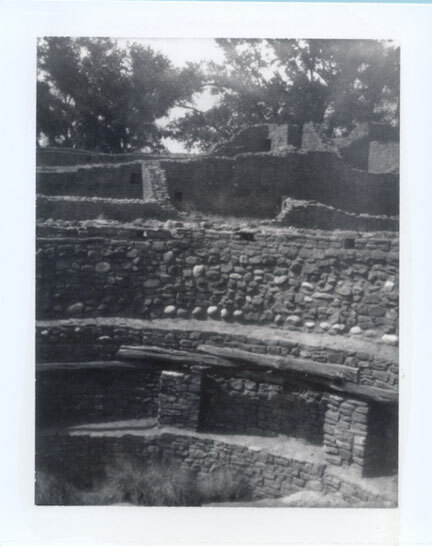 It was too hot that day to use the pinhole camera – Chaco Canyon is 16 miles in on a dirt road – dry and sere – and the day we were there a van of older Native American men had come to the main ruins to walk around and perform some ceremonies. We were reluctant to photograph then.